The Sarasota area scored 64.1 out of 100 from the result of more than 176,000 interviews conducted from January through December 2014 to end up at the top of the Gallup Healthways annual Community Well Being rankings. Northport-Sarasota-Bradenton won the top spot from “100 largest metro area in the United States.” Interviews were conducted in all 50 states plus the District of Columbia. There are five essential elements used to obtain a city’s well-being index. See if your city is on the top 10 list. John Allen's new listing in the lovely gated community of Red Hawk Reserve went under contract in just 4 days! Located east of I-75, the neighborhood is within minutes of Sarasota's University Mall. For outdoor activities, Twin Lakes Park is just across the street. Siesta Key Beach is a short drive from Red Hawk Reserve. Sarasota is quite a festive little city. There is always something exciting happening in the downtown area. This morning, Nik Wallenda of circus aerialist fame attempts to walk on a high wire from the Unconditional Surrender, sometimes called the Kissing Sailor statute, to the roof of Marina Tower. Streets in the area will be blocked off for over an hour and spectators are encourage to walk to the event or take the roundtrip “free” trolley from the Van Wezel Hall of Performing Arts parking lot. Wallenda is a six time Guinness World Record holder and walked across Niagara Falls last year. The walk scheduled for today will be 200 feet over U.S. 41. Wallenda is being allowed to do this walk without a tether. Sarasota, Florida, once again, hits the top of a list promoting its accolades. Penske Truck Rental recently released a report ranking Sarasota #10 in the US among moving destinations. Others named to the list were mostly major cities. Although Sarasota is a small city with a “big-city feel,” the area for this report included Bradenton, Venice, and North Port. 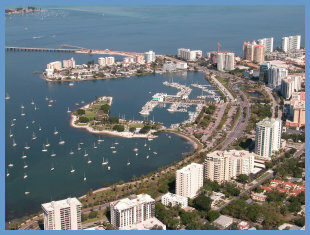 Sarasota is the largest of these municipalities in land and population. Penske compiles the list after reviewing online consumer truck rental reservations and inquiries. One way moves for 2012 were the only records analyzed.